Today the quail moved cages...yup, again! It's their third! 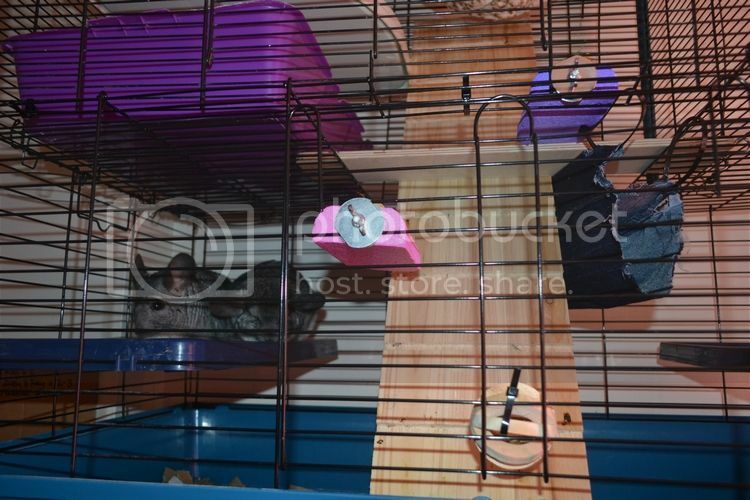 I was really happy for them in the 120cm cage they had originally, but when Aubree stole it they went into a two storey 100cm cage...although this was totally big enough, and when you factor in the extra floor and levels they had a lot of floorspace, I didn't like how little continuous running space there was. 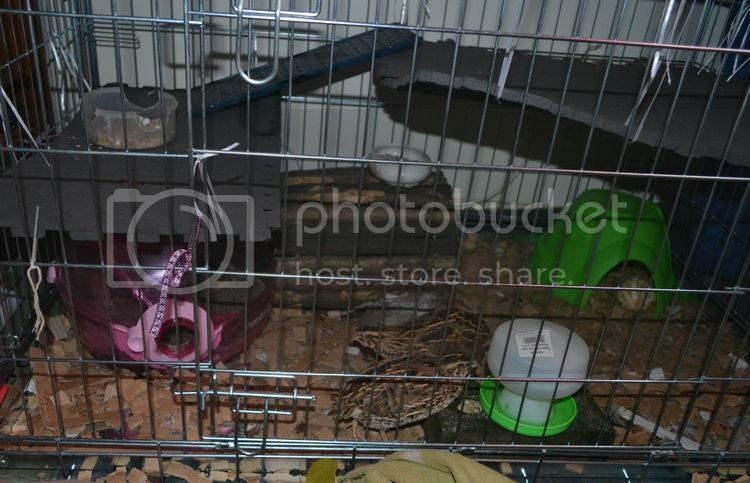 Their old cage was 100cm x 50cm x 100cm high; the crate is 110cm x 70cm x 75cm high! Of course this presented us with the issue of them 'boinking' - quail will launch themselves straight up into the air, and should be kept in either a low cage or one that is taller than 7ft, to prevent head and neck injuries, as it can kill them. We made two shelves from foam paneling, to stop any boinks!!! But then that left us with the double cage going spare, and I thought...y'know who'd enjoy that? 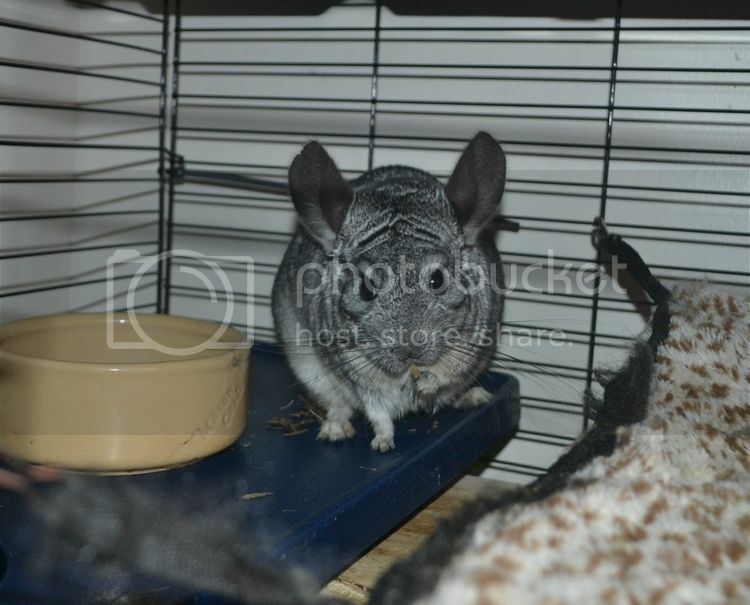 What about the chinny girls!! Totally not stressed after the cage move! Even Chilli didn't care - we used a cat carrier to transport them, they spent an excited half hour exploring, then fell asleep! 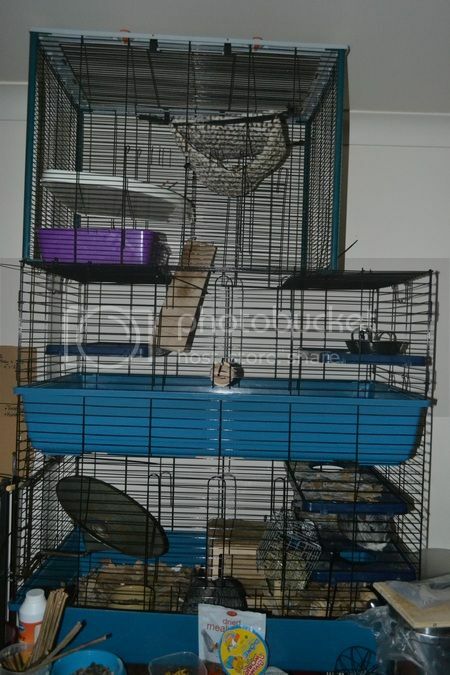 I really want to add some wooden hopping shelves but I can't find any in person and I don't trust buying them online...we bought 12+ wooden shelves off ebay and amazon before the chins came home, they cost a fortune, and not one of them fit the bars!! We then bought some bigger washers in, thinking that would mean we could use the shelves, but the screws were wrong then - agh! Ahhhhh you doing it again Red !!!! 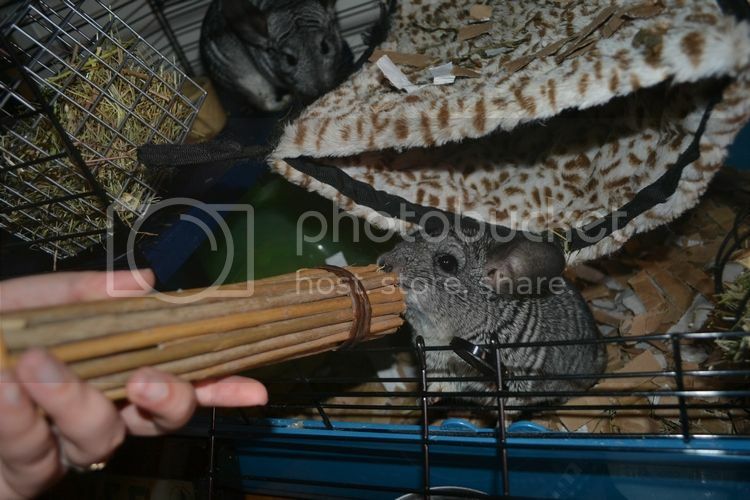 Im os enamoured by the chinchillas and even more so now Ive seen them in their new home. They are just the cutest little things. Do you get them out for cuddles?. That new house is perfect for them. What to do I told GN no more pets then I looked on cats protection and fell in love with about six cats. But I want to travel so must be good. I think its worse than dieting trying to work out if to add to the family or not !!!!!! NN that's why I'm so pleased we don't travel, because even if we took the dogs with us I'd have to find someone I trust to come care for the other fuzzies, and I just don't trust anyone...the last time we went on holiday was almost exactly four years ago now hahaha,we haven't had even one night's holiday since! 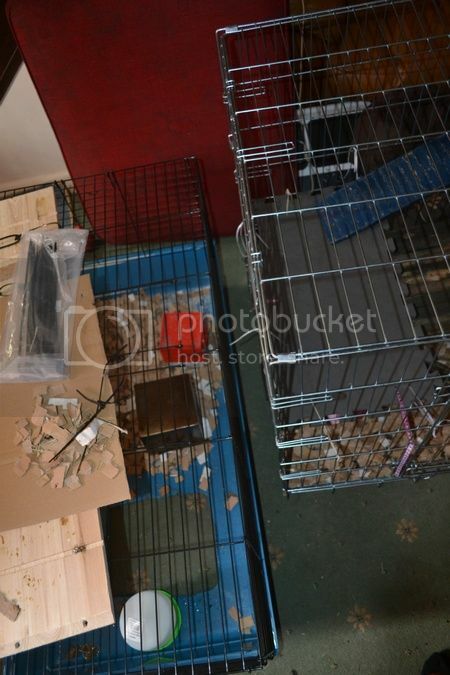 The chins LOVE their new space...I have an idea to burn a hole in the bottom of a 100cm guinea pig cage we have going spare today, and then adding it on top of their current set-up to make a three tier cage...can you imagine that!?!? Just need to figure it out, and make sure it will fit! Yes, I prefer to stay home with my kitties too! 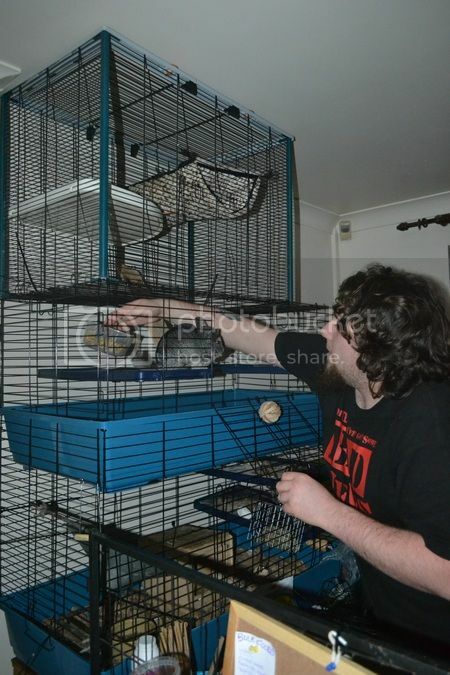 We had a neighbour really willing to look after our cats and hens and we let them once for five days. We were heart broken when we got home as no way had they been properly looked after. They all had a few drops of water left and it was obvious they hadnt been given fresh every day, they had the same food bowls although I had left out plenty of clean ones Cats like a fresh bowl for their food every day. The cats litter tray was just about over flowing with poo. We had gotten them such a nice expensive present for looking after them as well, and I was so reluctant to give it too them as I was so disappointed. I do travel Kate but by myself GN stays home and sees to the animals, I just feel so mean though as he wont go with out me, so doesnt get a holiday and when he looks at my photos he always says they are lovely and how glad he is I had a good time in such a wistful way. I really want us to be able to go together, I am quite happy to travel alone and do stuff by myself but its not the same as sharing an experience. I was hoping to take Mallory to Norway with me this Easter but as Ive not been well I have delayed it. She would have loved the snow, its really good again this year. No way could we have an older cat Kate as nice as that might be, GN gets so deeply upset when they pass. He would be constantly worried and fearful. Posted By: nanny north No way could we have an older cat Kate as nice as that might be, GN gets so deeply upset when they pass. He would be constantly worried and fearful. I'm the same as GN, NN. I fretted and fretted over the chin girls and they're only seven! I could never adopt an older cat or dog though...Kasper is turning six this May and I've already cried several times about him getting old and 'it won't be long until we lose him'...all the panic would be far worse adopting an older dog. 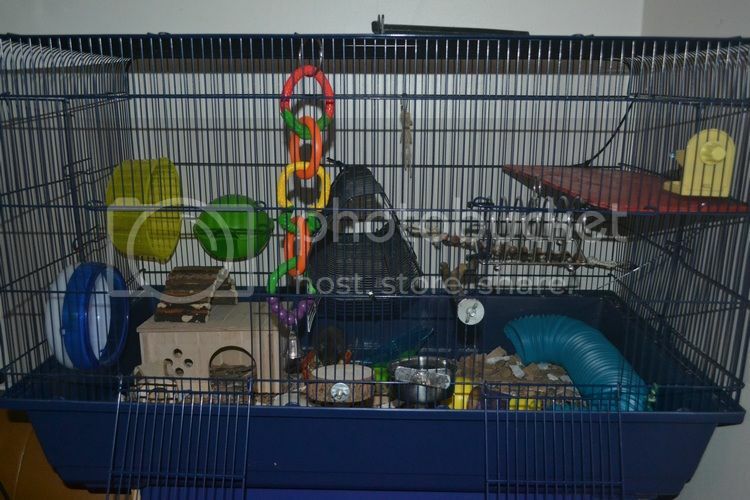 After the soldering iron broke it meant we couldn't use the 100cm guinea pig cage I wanted to add on, so I was wracking my brains trying to think what else we could use...downgrade Effie back to the Thickets and use the Mamble, as that's 100cm too? 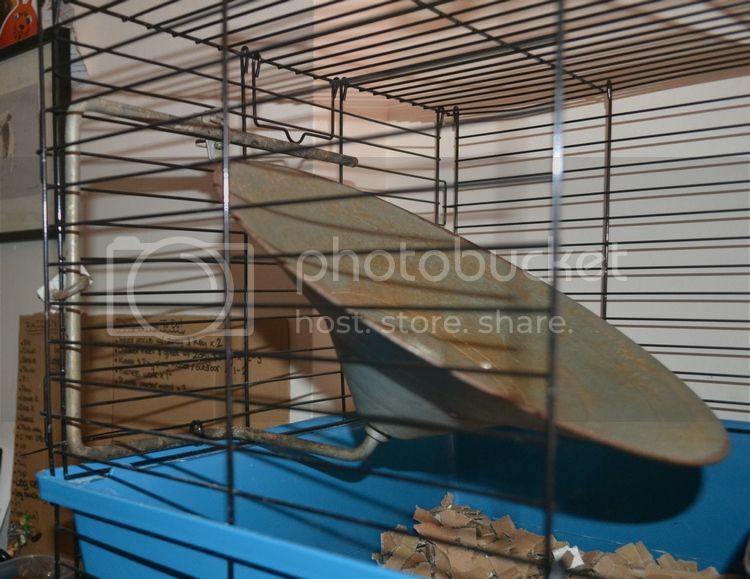 No, that's not fair...then it hit me, the Furet Plus is empty and, if we didn't include the base (which would also mean we didn't have to burn a hole in it), that would fit on top! 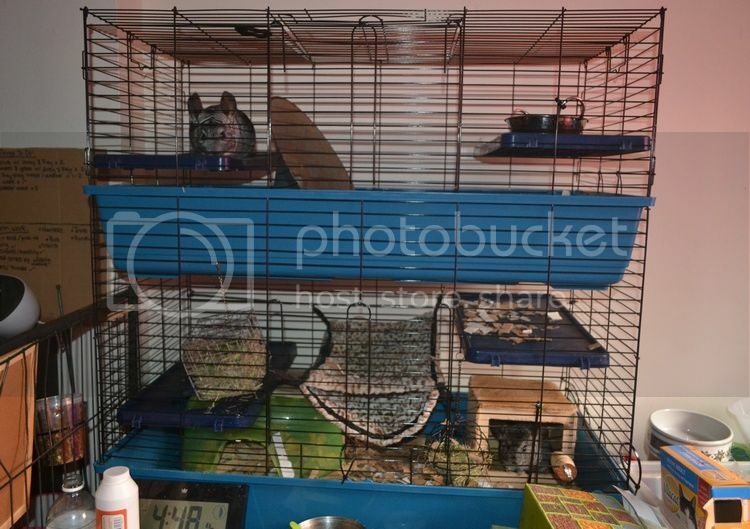 The Furet Plus is taller than a guinea pig cage, which makes up for it being 20cm shorter, and with a level and hammock it's quite a nice addition...I still want to add another hammock under the leopard print one. And we've used two wooden ramps to make the route up even easier too! 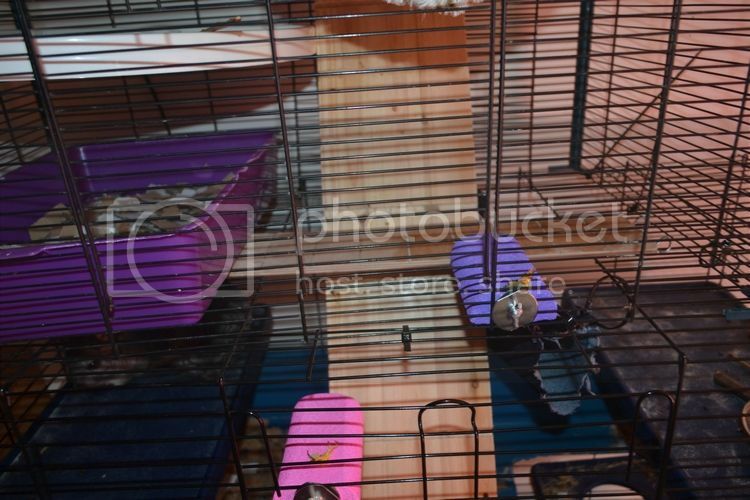 Oh also, we realised we had their wheel wrong this entire time - you can attach it to the cage bars, so it doesn't travel across the cage as they run and clatter about as much!!! Mark still mentions it sometimes when we see him - he says his car smelt for weeks after transporting Mr S.
Oh Neil I just spluttered water every where......... Mr Shitter the mouse ha ha ha ha thats priceless. People come into Rehoming asking for kittens/young cats because they want them for a long time, and then they're back within the year because the poor thing got run over (or they had a baby so want us to have it back, or they're moving and can't take it ...) Sometimes one a little bit older is better for some people depending on location, but I do know what you mean! 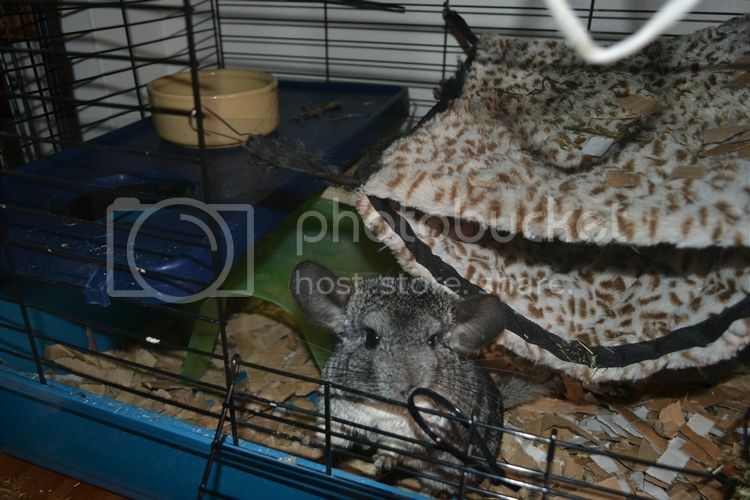 So much no here...nothing excuses leaving a rodent in the shed for a week with one bowl of food and one bowl of water, that is so bad - just because he smelt that was no excuse to neglect him!!! Also, did you know that in general men respond worse to the smell of male mice than women? Weird! Posted By: Kateb People come into Rehoming asking for kittens/young cats because they want them for a long time, and then they're back within the year because the poor thing got run over (or they had a baby so want us to have it back, or they're moving and can't take it ...) Sometimes one a little bit older is better for some people depending on location, but I do know what you mean! All those things can happen when you adopt an older cat too, though. In general if you adopt a young healthy cat / kitten it will live longer than a 12+ cat...people who adopt older pets are special, because you are setting yourself up for a higher chance of heartache and vet bills, but I couldn't do it...not for a dog or a cat. 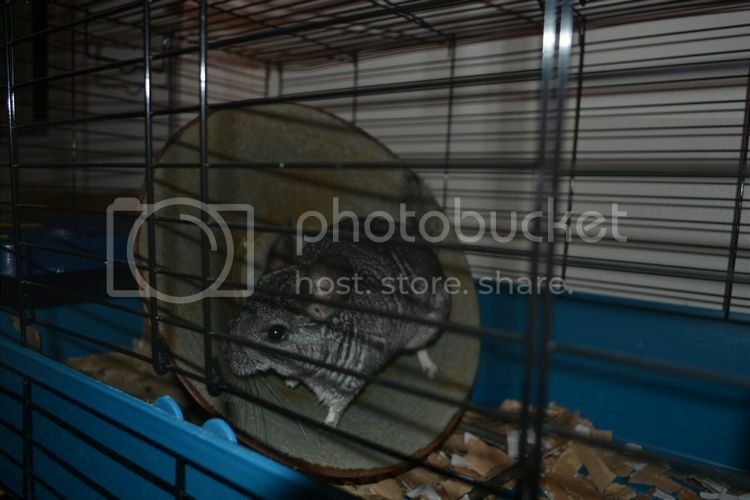 I was happy to take Tilt, she could have an average life expectancy, and I will adopt older rodents as the difference is usually less than a year anyway...but I couldn't do it with a dog. Saying all that, people have to have what they want. If what they want is a kitten then that's what they should adopt! 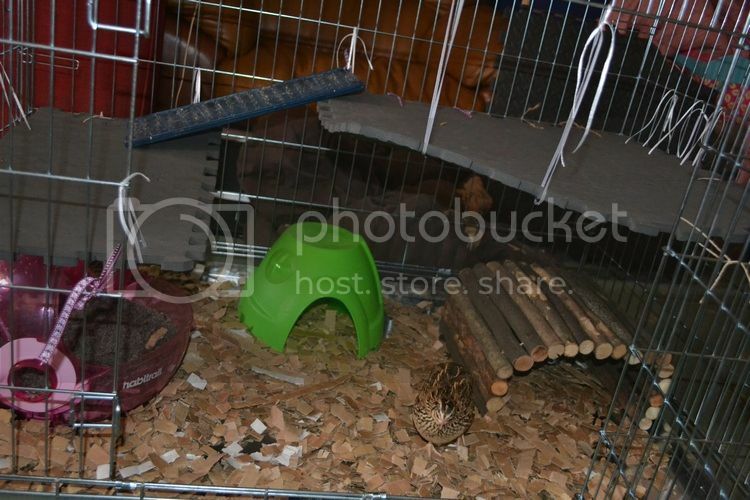 Easier to integrate with other pets, people enjoy watching them grow - you know as well as I do that every adoption is unique and should be best for owner and pet, and I would never criticise anyone for going with a youngster. There are no guarantees and I'm just pleased that there are (eventually) homes for them all.